ELIZABETH CITY, NC –– The 2016 Dodge Charger is full of flexed technology making it the quickest, fastest, and most powerful sedan. It respects the generations of Chargers that came before it in style and performance with an attitude that’s hard to ignore. Learn more about this retro-modern muscle car by downloading the 2016 Dodge Charger brochure below. The exterior looks commands attention with sleek details like projector headlamps, LED lighting, and a low, lean profile. Looks are just one part of the experience. The room to tote your crew and driver-focused interior is part of the Charger experience. Race-inspired details, soft-touch surfaces, the digital gauge cluster, and redesigned center console shifter make up a space dedicated to the driver. The 2016 Charger gets an EPA-estimated 31 MPG which will make driving around your crew of up to 5 passengers easy. Four engine transmission options offer power without compromise: 3.6L VVT V6, 5.7L Hemi VVT V8, 6.4L Hemi V8, and 6.2L SRT Hellcat Hemi V8. 12 color options, 15 wheel choices, 8 interior trims, and many accessories make it easy to personalize and impress your friends. Modern technology to keep you connected comes standard with Uconnect, smartphone engine start, Sirius XM, available Wi-Fi, and navigation. 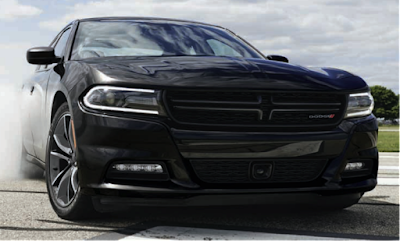 To see more details about these features, download the 2016 Dodge Charger brochure. If unmatched power from iconic roots is what you’re looking for, stop by Perry Auto Group to purchase or lease your 2016 Dodge Charger. Perry Auto Group has two dealership locations to serve you better at 1005 W. Ehringhaus St, Elizabeth City, NC, 27909 or 1001 Halstead Blvd Elizabeth City, NC 27909. Stop in for any of your auto or community needs, or feel free to give us a call at (252) 338-9100.